I use this product around 2 or 3 times a week. And, if I have just one piece of trim at a job, i can leave the compressor and hose in the van. Works great! 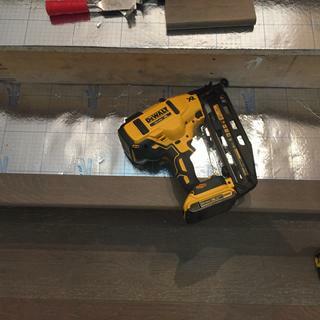 This was my first dewalt 20v cordless tool and it met every expectation! I just grab my finishing 16 guage nailer and instantly start using it. No need to plug the compressor in and use these 20, 50, 100ft air hose. Since then I bought other dewalt tools, like the brushless 20v drill kit. Extremely satisfied with it. The power it has is insane. Recommend this tool to everyone, hands down. Makes getting to work, continuing to work a DREAM! The last time I hauled the pancake compressor, hose and gun was the LAST time. This thing is a dream to use and maneuver. Every nail gun will be going to Dewalt cordless versions. I am on my third nailer. The first one lasted for about 15 nails & jammed & couldn't be cleared, my second gun lasted about 10 nails 3/4" maple to 3/4" maple 2" nails & the bottom of the magazine cracked,my third gun jammed again after literally 6 nails 2 1/2" nailing 3/4" to 3/4" oak. I have been a huge dewalt fan since 14 volt I now have just about every 20v tool ever made as well as just about ever flex volt tool including just buying 4 9v batteries for over $500. I used a paslode cordless gun for 20 years & was excited to lose the gas & add the dewalt gun but in 6 weeks & 3 guns later I'll just go back to a paslode. As a custom trim carpenter I can't afford the stress & down time. Is this compatible with the flexvolt batteries? removel of chuck cordless drill ?